The Macintyre family - Margo, Connie, Molly and their mother - love horses and everything about horses. When unexpectedly faced with the necessity of making their own way, the girls decide to open a riding school with a string of horses that has been left to them. Scarlet Royal, a beautiful chestnut horse, is Margo's pride and joy. To others he seems temperamental and difficult to handle, but between Margo and Scarlet Royal there is a unique feeling of loyalty and understanding. When circumstances force the sale of the chestnut to a girl whom Margo finds difficult to like, she feels a deep sense of loss that time doesn't seem to help. 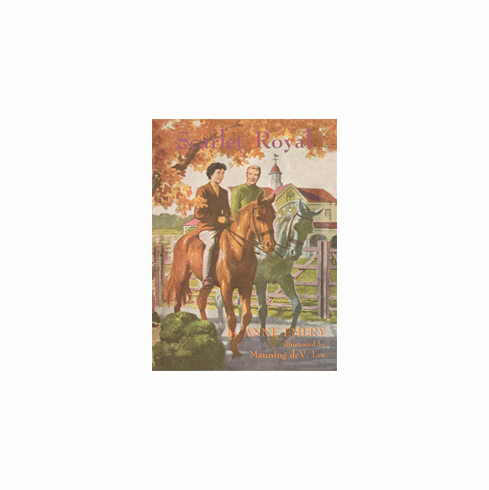 But the responsibilities of a maintaining their country home and the constant problems of caring for the horses and running a riding school keep Margo and her sisters busy. When they give room and board to Neil Campbell, a young student at a nearby college in exchange for his help with the horses, things become easier and the entire family finds new confidence in their venture. Will Margo find romance and will she be able to get Scarlet Royal back? A happy combination of romance and horse story!